According to Dr. Peter Jennings, IRRI’s first rice breeder, who was a friend and colleague of Tanaka, he was, by far, the most experienced rice scientist at IRRI in those days. The photo shows Dr. Tanaka (left), conferring with Dr. Jennings during the early 1960s. “Tanaka’s love was mineral nutrition, particularly, deficiencies, but his job at IRRI was really to take the tropical rice plant apart, analyze it—the stems, the leaves, the architecture," says Jennings. Later this year in November, IRRI will be observing the 50th anniversary of the release of IR8 and recognizing all the dedicated scientists who had a role in its development. LOS BAÑOS, Philippines—The lack of good-quality seed is one of the major constraints in rice production in many developing countries. In many poor rice-growing countries, the farmers rely heavily on farmer-saved seed for their crop production rather than commercial seed produced by the private sector. Unlike commercial seed, farmers’ seed is not certified by government authorities to ensure the best possible harvest. By providing seed with inferior quality, the farmers themselves may be unintentionally contributing to food insecurity, according to the Food and Agriculture Organization. Knowledge of the technical aspects of seed production and understanding the benefits of using quality seed are important aspects of enhancing the seed systems and the use of quality seed among farmers to improve their food security. To bridge the gap, the Training and Impact Acceleration Units of the International Rice Research Institute (IRRI) and IRRI Education conducted the Quality breeder and foundation seed course for researchers, seed inspectors, and seed producers. The course was developed by IRRI in collaboration with the Japan International Cooperation Agency (JICA). 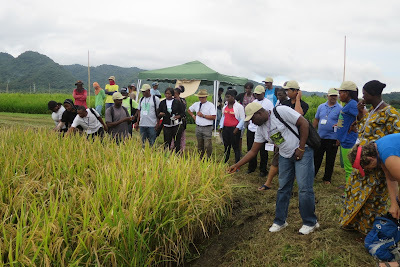 The training is a component of the Extension Capacity Development for Rice Food Security in Africa, a three-year (2016-19) JICA-IRRI cooperation project. Now in its second phase, this initiative aims to amplify the impact of rice research through capacity building of rice farming practitioners and the development of the seed sector in the region. “The program was designed to provide a mix of skills training in the field, interaction and learning from researchers and scientists, and discussions and cross-learning opportunities among participants,” said Jason Beebout, project manager of the Impact Acceleration Unit. “At the end of the course, participants were asked to pull together what they had learned into a plan so that they can integrate their new knowledge into their day to day work roles and responsibilities." Twenty-one rice researchers and seed specialists from 10 countries attended the 3-week course, which ran 12-30 September. Most of the participants were from member-countries of the Coalition for African Rice Development (CARD) including The Gambia, Ghana, Liberia, Nigeria, Rwanda, Sierra Leone, and Zambia. Three participants came from Cambodia, India, and Nepal. CARD is an initiative of JICA and the Alliance for a Green Revolution in Africa. The coalition aims to double annual rice production in Africa from the present 14 million tons to 28 million tons by 2018. CARD also forms a consultative group of donors, research institutions, and other relevant organizations to work with rice-producing African countries.“While this effort is relatively small in terms of numbers, we do hope this contributes to the ongoing CARD activities and can be a spark that ignites a seed revolution,” Beebout said. A local producer of fertilizer with BCA in Cambodia shows his organic vegetable plot to a farmer. PHNOM PENH, Cambodia—Biological control agents (BCAs) can be used for sustainable management of major pests in important crops, especially rice. This was a key message at a national forum on regulation, use, and trade of biological control agents. The forum was organized by the International Rice Research Institute (IRRI) and partners held 22-23 September in Phnom Penh. BCAs are living organisms, either animals or microbes. The mass release of BCAs has been shown to effectively keep insect pest populations below damaging levels. However, the adoption of BCAs by farmers in some ASEAN countries is hampered by a number of factors, including lack of awareness and the absence of registration process to bring BCA options to the market. 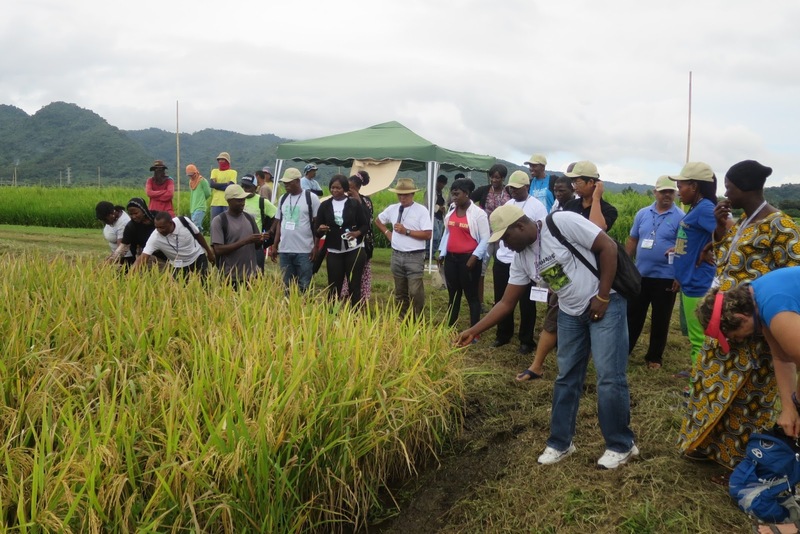 The BCA forum sought to create awareness of options for country’s farmers, government officials, nongovernmental organization (NGO) and private sector representatives, and researchers. It also provided a platform to discuss trade regulation and pathways for BCA adoption in Cambodia. More than 140 participants representing the groups mentioned above attended the forum. Researchers from neighboring ASEAN countries also provided a regional perspective on BCA. They discussed the current status of BCA regulations and use in Cambodia. Researchers and NGO staff presented their findings from BCA experiments, particularly on the use of Trichoderma and Metarhizium, two beneficial fungal agents, in Cambodia and Vietnam. Private companies that manufacture BCAs provided product demonstrations. Additionally, participants identified organizations, individuals or groups in Cambodia interested in integrated pest management (IPM) for rice. The BCA forum was organized by GIZ-ASEAN Sustainable Agrifood Systems and the project, Development of an Ecologically-based Participatory Integrated Pest Management Package for Rice in Cambodia (EPIC). EPIC is an IRRI project funded by the Feed the Future Initiative of the United States Agency for International Development. Cong. 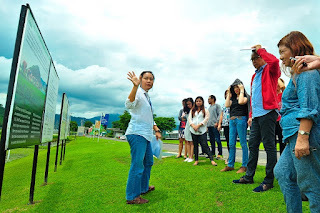 Salon (left) visited IRRI headquarters to learn about the scientific research program of the institute and these can be shared with Filipino rice farmers. 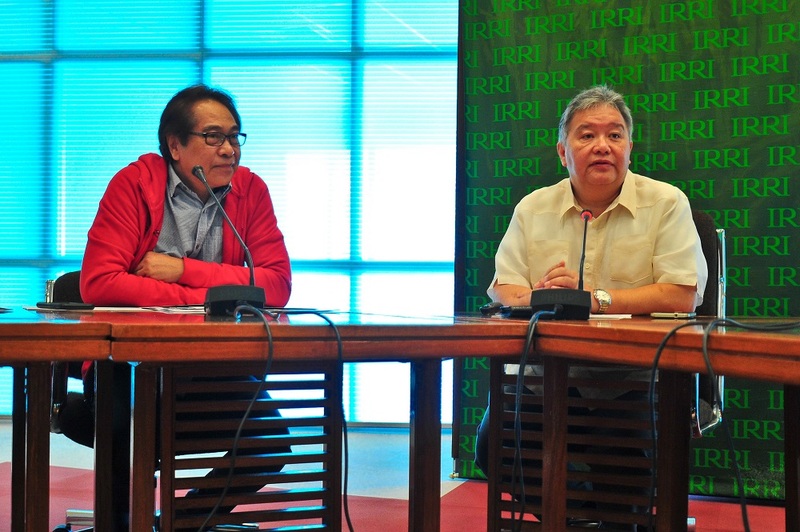 LOS BAÑOS, Philippines—“We need to popularize these technologies,” Congressman Orestes Salon of the AGRI Partylist of the Philippines said after being briefed on the activities of the International Rice Research Institute (IRRI). Congressman Salon and his staff visited IRRI headquarters on 9 September to learn about the scientific research program of IRRI and how the results of research can be shared with Filipino rice farmers. The AGRI Partylist advocates for the welfare of farmers, fisherfolks, and families who belong to marginalized groups who do not have the access to basic social services in different parts of the country. They implement programs that aim to benefit those experiencing severe poverty and need assistance to meet their basic human needs. During the Party’s visit, they learned about IRRI’s work in developing rice varieties that can thrive under erratic weather patterns and produce more nutritious grains, the application of satellite imagery to rice production, water-conserving technology, and training for young scientists and extension workers. Dr. Olivyn Angeles (in photo) from Crops and Environmental Science Division, and Dr. Shoba Venkatanagappa from the Plant Breeding Division, also provide the party with an overview of the Long-Term Continuous Cropping Experiment and IRRI’s breeding lines. 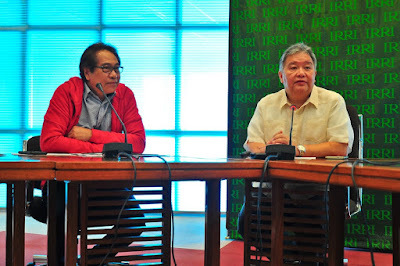 Dr. Bruce Tolentino, deputy director for Communication and Partnerships, emphasized that IRRI is an international public institution and its research and technologies can be accessed and used by everyone. LOS BAÑOS, Philippines—The International Rice Research Institute (IRRI) is pleased to announce the appointment of Dr. Nafees Meah as the new IRRI regional representative for South Asia. In his new role, Dr. Meah will work with governments of the South Asian Association for Regional Cooperation (SAARC) countries, including Nepal, Bangladesh, and India to represent and coordinate IRRI’s programs regionally. In consultation with key universities, civil society organizations, international donors and organizations in South Asia, Dr. Meah will lead the development of a regional strategy and support the development of individual country strategies for IRRI’s research, outreach, training and resource mobilization activities. Dr. Meah comes to IRRI from the Government and UK Research Councils (RCUK), where he served from 2012 to 2016 as Director of RCUK India office. During his time there, Dr. Meah lead RCUK’s presence in India and developed a programme of activities to deliver the organization’s strategy for deeper research and innovation engagement with India. He is also a recognized expert on sustainable agriculture, food security, and climate change. Dr. Meah holds PhD and MSc degrees in Chemistry from the University College London and the University of Toronto, respectively as well as an LLB from the University of London. He has authored research papers, articles, and reviews in energy and climate change, chemistry, food science and risk assessment. Dr. Meah will be based in the IRRI India office in New Delhi and will officially join the team in October, 2016. In a complementary role, Dr. Noel Magor will take over as interim IRRI country representative for Bangladesh, beginning in mid-September. This is in addition to his current role as head of Impact Acceleration. As interim IRRI representative, Dr. Magor aims to strengthen the longstanding relationship and commitment of IRRI to Bangladesh. With his move to Bangladesh, Dr. Magor will be returning to a country he knows well, having lived in Bangladesh for 21 years and seen his three children born there. Dr. Magor has significant professional experience in Bangladesh, and has supervised food security and poverty alleviation projects in the country. Previously, he was also seconded to the Bangladesh Rice Research Institute for 6 years as a Farming Systems Agronomist and has served as an IRRI representative for Bangladesh from 2001 to 2006. The two appointments align with IRRI’s commitment to further develop a rice sector research strategy in Bangladesh and the South Asian region. The representatives will work together to strengthen IRRI relations with government institutions, public and private sectors, and civil societies to further enhance research collaboration and ensure food security in Bangladesh and South Asia. LOS BAÑOS, Philippines—The Philippine Rice Information System (PRISM) project is conducting a series of workshops on basic geographic information systems (GIS) for its regional partners. 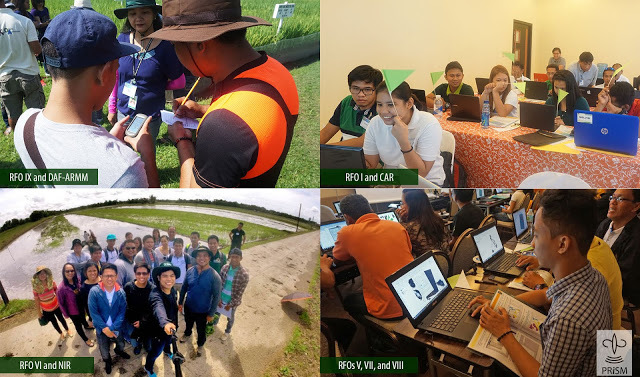 Funded by the Philippine Department of Agriculture (DA), the activity trains field officers and local government units in visualizing rice area and yield, GPS-based field observations, and other data generated by PRISM for planning programs and interventions for the country’s rice sector. 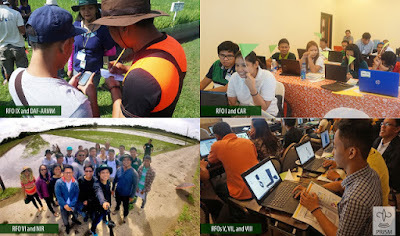 The training (photos above) is enhancing the skills of DA-Regional Field Offices and local government units (LGU) staff in using QGIS, a free and open source GIS software. The workshop uses actual data collected at PRISM monitoring sites throughout the country. 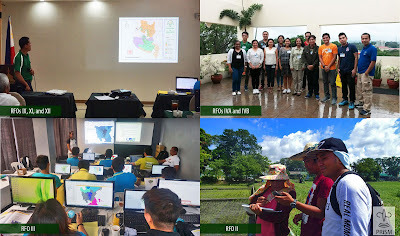 At the end of each season, PRISM generates accurate and timely information on rice areas, the start of cropping seasons, and rice yield that can help the national government and the rice-growing regions develop policies and plans related to rice production, particularly in mitigating the impacts of natural calamities and reducing yield losses caused by pests. Around 19 tropical cyclones or storms enter the Philippine Area of Responsibility every year, and of these, usually 6 to 9 make landfall causing considerable crop damage. The information collected by PRISM is available through its portal. The training helps in understanding the value of presenting data in map format, according to a workshop participant. The remaining workshops will be held in September and October 2016 for DA-RFO XIII and PRISM crop health specialists, respectively. The workshops are being conducted by PRISM staff from the International Rice Research Institute(IRRI) and PhilRice. The lead trainers from IRRI are Arnel Rala, Cornelia Garcia, Aileen Maunahan, and Jeny Raviz. The PhilRice trainers are Mary Rose Mabalay, Juanito Maloom, Elmer Alosnos, Mabel Barroga, and James Leyte. Mary Anne Gutierrez, Jane Girly Balanza, Neale Marvin Paguirigan, Creigton Czar Guevarra, Ethel Princess Banasihan, and Frances Grace Amanquiton are co-facilitating the training series. Ramiro ‘Ram’ Cabrera, 75, an award-winning graphic designer at the International Rice Research Institute (IRRI) for more than three decades, passed away in Antipolo, Manila on 1 September. Mr. Cabrera was among the first group of communicators hired in the early 1960s by Robert F. Chandler, IRRI’s first director general, to begin getting the message out about the new Institute’s mandate to fight hunger in the world. He retired in 1997 after 31 years of service to the Institute. In the early days, he was responsible for developing IRRI’s visual identity, including its logo and other design elements used in the Institute’s publications and other communication materials—many still used to this day. He led the design team that produced A farmer's Primer on Growing Rice, one of the most successful extension booklets for farmers in international agricultural publishing, resulting in around 50 editions printed in more than 40 languages and dialects for more than 20 countries. Mr. Cabrera won a number of awards for his work from the Association for Communication Excellence (ACE) in Agriculture, Natural Resources, and Life and Human Sciences. In 1996, he won ACE’s Outstanding Professional Skill Award in Graphic Design for a set of posters depicting rice activities including planting, harvesting, and marketing. In 1997, his graphic design and layout work contributed to the team effort that produced IRRI’s 1995-96 annual report, Listening to the Farmers, which won an unprecedented set of ACE awards including Outstanding Professional Skill Award, two Gold Awards, and one Silver Award for design, photography, and the cover. Also in 1997, he won ACE’s International Award of Excellence for his career body of work in art, graphic design, and photography. After his time at IRRI, Mr. Cabrera also did similar creative design work for the Asian Development Bank.